Books & other thoughts: No! That's Wrong! A gust of wind blows through a village in China, whisking a bright red pair of underpants from a clothesline. They sail through the air, finally landing on the head of a little white rabbit. The rabbit is thrilled with her jaunty new red "hat." She scampers through the forest with her hat, allowing all her friends to try it on. It's a bit too small for the elephant, and too big for the fox, but all the rabbit's friends just love it anyway. 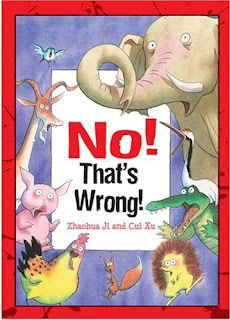 Each illustration is outlined in black, and in the white border are the words, "No, that's wrong. It's not a hat." The rabbit continues through the woods, sharing the hat with her many friends, including the hen, the pig, the heron, and the crocodile. All agree that it is a terrific, magnificent, fantastic, special hat. Meanwhile the narrator insists, "No, that's wrong. It's not a hat." Finally the rabbit meets up with the donkey, who asks, "Why are you wearing underpants on your head?" "It's a hat," insists the rabbit. But donkey shows her proof: pictures of people wearing underwear, so the rabbit tries putting them on the "right" way. But how is a rabbit's tail possibly going to fit? And when it doesn't, is the rabbit going to let that killjoy donkey take away her pleasure in the wonderful hat? Not if her friends have anything to say about it! This deceptively simple story takes a humorous look at fashion, peer pressure, friendship, and the value of believing in oneself. Younger children will delight in the hilarious premise of animals wearing underwear on their heads. Older children will appreciate the more subtle concepts of the book, and will root for rabbit as she searches for a way to silence that critical voice once and for all. Award-winning Chinese illustrators Zhaohua Ji and Cui Xu have teamed together to produce this, their first picture book, a delightful combination of humor and insight. The dreamy landscapes, adorable animal creatures and simple text combine to create a charming story that has definite kid appeal.